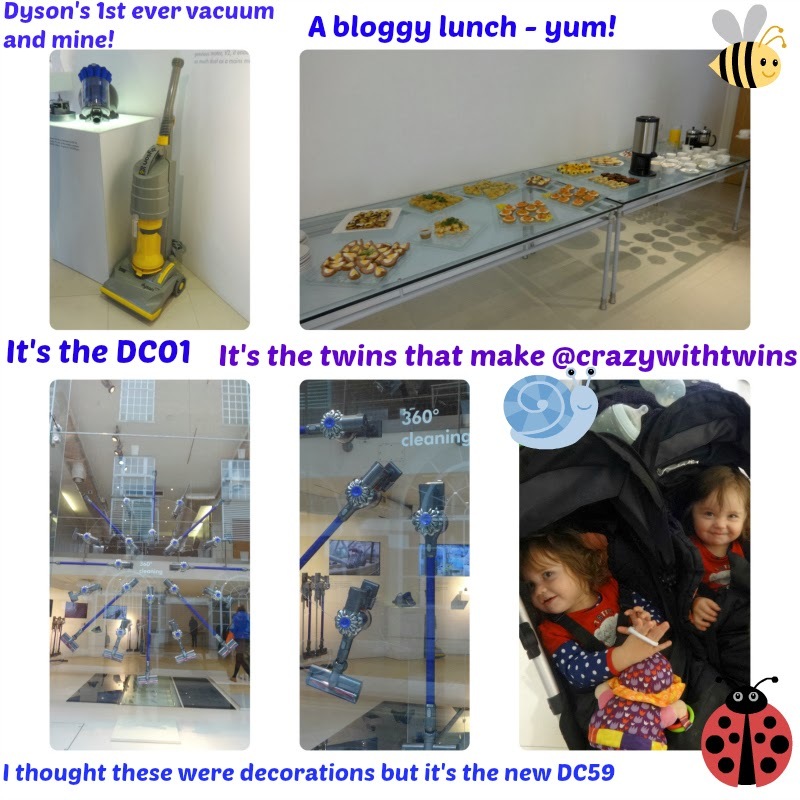 New Mum Online: Dyson DC59 - yes please! Dyson DC59 - yes please! I went to a blogger event yesterday at the Dyson Press Office and it made me really nostalgic. They showed us the DC01 (top left below). I never realised back in 1996 when I bought my first ever vacuum in my first ever home (away from home) that I was buying their 1st model. All I knew was that my favourite cousin had one, and as she was my "older sister" that I looked up to, I had to have one too. Being that I was only 23, of course I could not afford one. It wasn't the done thing to buy things on a credit card back then, so what did I do? I bought it from a catalogue. It was a long time ago, BUT IF memory serves me right, I think I paid for it in 7 installments of £50 each. When I arrived yesterday I thought the window was done in Christmas decorations, but on closer inspection I could see that those lovely silvery circles were part of the DC59 itself. Emma Crazy with Twins, was crazy to bring her twins.... ;-) only jesting. They were adorable and so so much fun. I am sitting here now, with the Operating Manual next to me (it is like a leaflet as there is not much to say as the machine is so easy to assemble and use - in fact I used it without reading the instructions). Funny I now see that points one and two are concerning not allowing children under 8 years of age to use it, and when children do use it it should be with supervision and not used as a toy. Further confession is he does think it's his new toy! I put my DC01 out to pasture (it's in the garage) after about 14 years of use, and bought a Vax. It has never ever performed properly (bar a couple of days when new) so as a result I haven't enjoyed vacuuming since. I did ring Vax when it was about 2 weeks old to say that it only performed when new and no longer did and they made me pay about £8 for new belts to be posted to me. When I unscrewed the machine to install a new one, the current one was not broken, worn or defective. They'd sent me four. I have never needed them. I have worked in import/distribution/sales/customer service and sorry but when something is that new, you do not charge someone for parts. it is incredibly light and easy to use. I love that it can be wall mounted and grabbed for use. it's a fun and sleek gadget so boys love it. It went down a storm with Aaron and the husband. 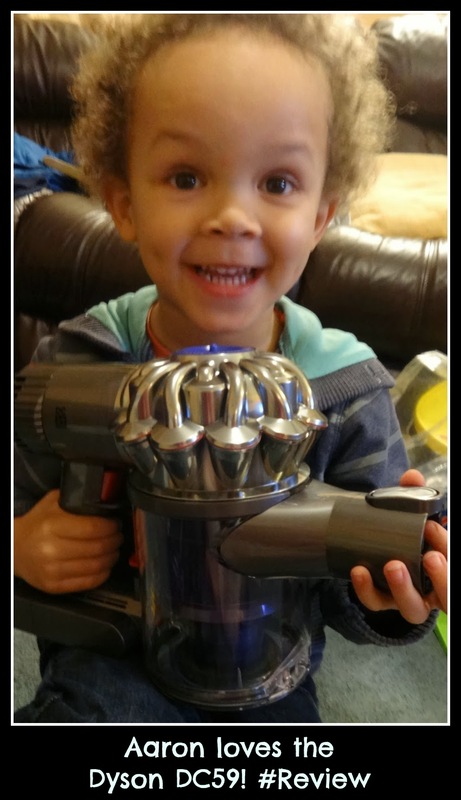 It makes vacuuming fun, quick and effective - the suction has to be seen to be believed. They demonstrated the suction at yesterday's event by putting baking soda powder on the floor and by also putting it down a crack between floor tiles. The portable cordless Dyson was the only product (we tried it against competitors) that sucked the powder out from what was a simulation of cracks between floorboards. I don't mind that it stops when it needs recharging, as the concept of little and often does it for me. Grab it when you want to vacuum 3-4 rooms, or quickly clean an area under a dining table after a meal. It can be used in the car and on the stairs, as the long hose can be taken off. Doing the stairs with our Vax has always been a massive ordeal - no longer. In fact just pulling the Vax out of the cupboard was a big deal. All in all I am LOVING our new product, as is the whole family. It copes equally well with carpet/hard floors. I would say, if you have a relative that wants one for Christmas, you will be making them very happy. I think cordless vacuums have been getting a bad rap as they just don't perform. We saw that with the competitors we tried yesterday, but the DC59 performs better than the original DC01, and the husband can't believe the grip to the floor, the suction! It's making mince meat of keeping our flat clean yesterday and today. We're all converts. Disclosure: I was given a Dyson DC59 for the purposes of an honest review.